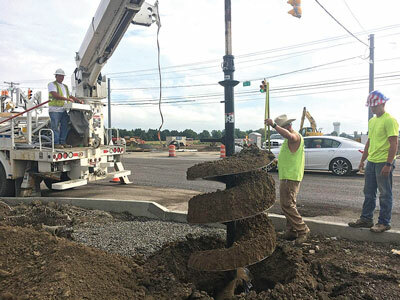 Construction crew members from Danbert Inc. spent the morning drilling holes along Route 31 with a machine called a digger to create light pole foundations. Workers measured how far the corkscrew drill bit needed to go into the ground and shook the dirt off on the side. The work will continue into next week, and is part of a larger project to construct a road to Route 4. Pictured are, left to right, foreman Chris Warner, operator Brandon Horsley and groundman Garrett Warner.